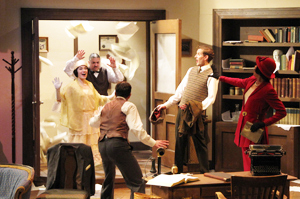 MFA Designer Emily Blumenauer featured in American Theatre Magazine! CLICK HERE for more info. Brooklyn College Theater Program featured in Shanghai! CLICK HERE for more info. CLICK HERE to check out our Costume Shop blog, The BC Dressing Room. Leveraging our location in New York City, we provide rigorous professional training in scenic, costume, and lighting design, as well as related technical theater subjects for students seeking a career in the theatre and entertainment industries. Our professional program emphasizes the synergy between the theoretical design skills developed in the classroom and their practical application to productions on campus. Students routinely design all of the shows in our fall and spring seasons, including having the opportunity to design for world premieres as well as established scripts, working with well-known and emerging playwrights, directors, and other theater artists. Our principal goal is to support our students' development as individual theater artists who, upon graduation, will be ready to forge their own path forward and contribute to and claim their place in the profession. To that end, students diligently work to develop the tools necessary to conceive and develop design ideas, engage in critical thinking, and communicate their ideas both visually and verbally. Our team of dedicated, professional design faculty mentor and guide the students’ progress. In order to make industry connections and further develop professional skills, we recommend students for projects with professional designers and theatre companies. 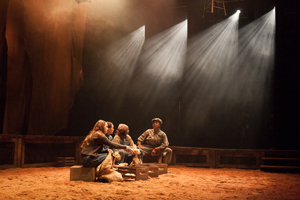 We encourage student internships and related work in the NY professional theater. Qualified candidates participate in New York City based National Portfolio reviews at the end of their third year. Our alumni and faculty networks function as a gateway to professional opportunities for graduating students. 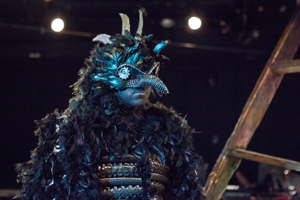 We seek talented motivated students from varied backgrounds and diverse cultures interested in preparing themselves to work as dedicated theater makers, innovators, and artists. Applicants must have a solid undergraduate concentration in one or more of the design areas and/or a strong background in art. Applicants must be interviewed by the Design faculty and must present a portfolio of their most representative work, which need not be solely in one design area. The MFA Design program requires 60 hours of course work and typically takes three (3) years to complete.